Take up the battle in a world beset with magic and evil like never before! 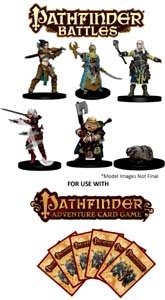 The iconic heroes of the Pathfinder world burst onto your tabletop with this set of 6 gaming figures for use with the Pathfinder RPG or the Pathfinder Adventure Card Game! Each figure is an ALL NEW sculpt featuring a dynamic pose, incredible detail, and a premium paint job. Competitive by nature, Amiri's constant efforts to outdo those around her eventually pushed her tribe in the Realm of the Mammoth Lords to betrayal. When her supposed comrades tricked her into a suicide mission against giants, Amiri's rage was so great that she took up a giant's sword and slew them, forcing her to abandon her home forever. From a young age, Kyra was entranced by her small town's temple to Sarenrae and the graceful priestesses who maintained it. Yet when even those holy warriors were unable to protect the town from marauders, Kyra emerged from the ashes and swore her life to Sarenrae, vowing to redeem the evildoers of the world - or put them down for the good of all. Ezren spent decades as the son of a successful merchant, only to have his world shattered when he discovered proof of his father's heresy against Abadar the Banker God. Convinced that he'd wasted his life, Ezren renounced his family and set out to become an adventuring wizard and prove to himself that you're never too old to start over. Merisiel is one of the Forlorn - an elf raised inhuman society, forced to watch their friends and family grow old and die. Decades as a child on the streets taught her to live life to its fullest, because you never know what tomorrow will bring. It's also taught her that just about any problem can be solved with a knife - one way or another. Harsk always preferred the open fields and skies to subterranean mines, and spent his childhood walking in the woods with his trusty crossbow. yet his carefree days came to an end when he was unable to protect his own brother from slaughter by giants. Taking up his brother's axe, Harsk became a force of justice in the wild places of the world. Prickly, stubborn, and absolutely fearless, Biter the badger makes the perfect companion for Harsk, keeping the gruff dwarf company on their long, silent treks through the countryside. While neither of them is much for displays of affection, Biter is the closest thing Harsk has to a best friend, and each would give his life to defend the other.